Obsessed with creating the most showstopping jewelry and watches, designer Fawaz Gruosi loves to make time come alive. 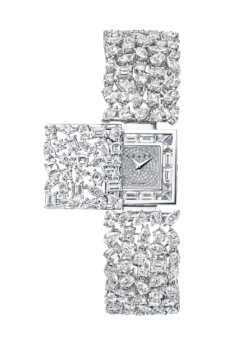 With the newest Allegra 25 high-jewelry watches unveiled this year, de Grisogono places shimmering diamonds front and center. The 18K white gold case’s design features ribbon-like curls of dedicatedly interlaced woven gold that are bedecked in diamonds. Thanks to the three-dimensional volume of the 29 ribbons, glimpses of light shine through and enhance the diamonds’ brilliance. 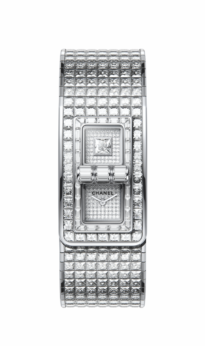 Even the dial of the quartz watch, showing hours and minutes, is paved with snow-set and bezel-set diamonds. Gruosi placed diamonds wherever he could, including on the folding clasp, using more than 12 carats in total. 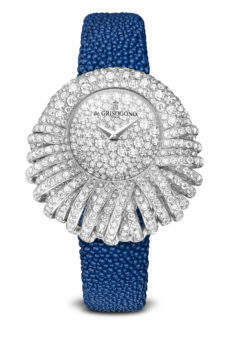 These sparkling stones are offset with a sapphire blue galuchat strap.